The Aqua Mirage Club, Marrakech is a family-friendly all-inclusive hotel in Oulad Ikhia. The gorgeous hotel has a spectacularly authentic interior, full of colour and classic Moroccan influences. There are fantastic facilities available including an in-house spa, a heated pool, a variety of events and even an in-house Aqua Parc - where guests of all ages can have fun in the beating sun. You can choose from a stylish selection of well-furnished rooms with pool or garden views, plus outdoor pools, a restaurant and lively bar to keep you entertained all day. Try delicious Continental cuisine at its main restaurant or order fabulous Marrakech cuisine ala carte, Aqua Mirage Club is rated favourably by tourists for its food and facilities. Aqua Mirage Club All Inclusive is located just 11 km away from Marrakech, while Imlil is 45 km away. The nearest airport is 8 km away at Marrakech-Menara Airport. The Noria Golf Course is 3.1 km away. 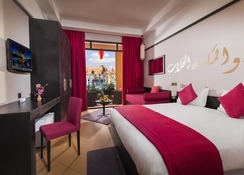 The Aqua Mirage Club, Marrakesh has single, double, triple and a variety of family rooms. Every room has a flat-screen TV, modern en-suite bathrooms, a terrace, telephone, toiletries and hair dryer. The hotel has a Continental restaurant that serves major meals of the day in buffet style. The breakfast is very highly rated among Marrakech hotels. There is also another a la carte restaurant for evening meals. A minibar and a snack bar are also available to enjoy throughout the day. Aqua Mirage Club provides many recreational amenities to its guests. There is a pool for adults and kids and a water park to splash around in. Sports facilities like billiards, football, tennis, darts and more are provided. There is a spa, a fitness centre and a nightclub. Additional Information: Additional fees may apply for certain facilities, amenities or activities. City /Tourist tax is payable locally. Good place for a family holiday. Everything needed and staff so helpful and friendly. Excellent variety of food and water park brilliant.